Three little words or, rather, one word three times has followed the 48-year-old star since his career began — and he wouldn't have it any other way. Memorable lines can be tricky for the actors who utter them on the big screen. The more the words catch on, the more likely the stars are to hear them quoted back by fans again and again (and again) — for years to come. 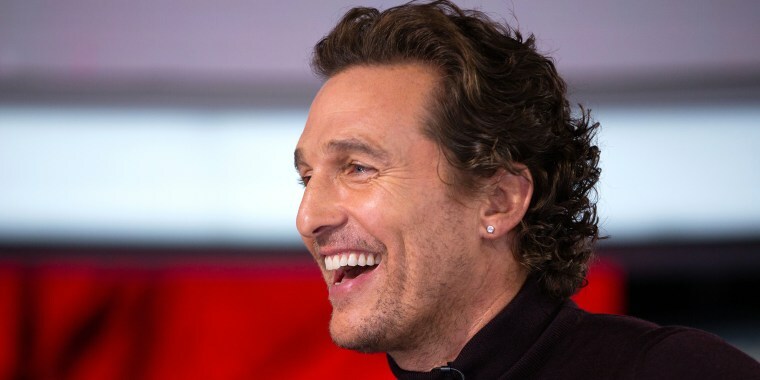 For Matthew McConaughey that means the words he first said in the '90s flick "Dazed and Confused" will likely follow him forever: "Alright, alright, alright." And when he sat down with TODAY's Savannah Guthrie Wednesday, the star insisted that was "alright" with him. "I said it," he told her when asked if he ever gets tired of constantly hearing that catchphrase. "I mean, that's the first three words I ever said in my film career, so it doesn't bother me when people say it." In fact, he celebrates it. "It is three affirmations," he explained. "What it does for me ... that's the first three words I said in my first film 'Dazed and Confused,' and now, I'm doing that in 1992. I don't know if that (acting) is going to be a hobby. It turned out to be a career 26 years later." It's a career that the Oscar winner loves and one he's grateful for — and those words serve as a reminder of that. "So when I hear it, when other people say it, it's a callback to 26 years ago when I first started this thing called acting, which turned into a career," he added with a smile. And he doesn't mind quoting his character, Wooderson, himself. When the topic turned to McConaughey's parenting style with the three children he shares with wife Camila Alves, he said, "We mix the 'alright, alright, alright' into the discipline." Which means that kids Levi, 10, Vida, 8, and Livingston, 5, are guided by mom and dad's "similar moral bottom line," but they also get to enjoy laid-back Friday nights at the family home. "Friday night is the no-curfew night. It's pizza night; it's a movie night; it's all the kids can sleep with mama and papa night." And it's even family dance night, too.